This is the sequel to Covert Fae, and I will start off by saying that at this point, one thing that bugs me is the titles of these books. 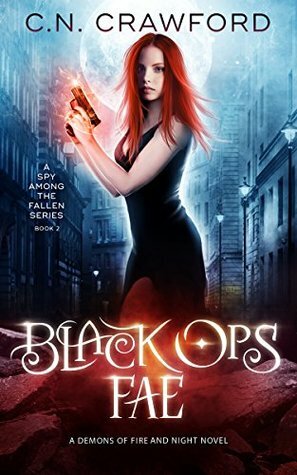 "Black ops fae" just sounds awkward to me, and honestly doesn't fit the theme of the book. She's not working for the CIA, she's literally just disguising herself to not die. Anyhoo, titles aside, I really enjoyed reading Black Ops Fae. Much more so than the first, and I chalk that up to the world-building and characterization being done in the first book, so this book had much more of a focus on action which is always a plus for me. In terms of plot, I did feel that the ending was predictable but I enjoyed the lead up to it. Ruby is now teaming up with Adonis, who is pretty smokin' tbh, to figure out a solution to this whole mess. Ruby's finding out that the people she thought she could trust really don't have her back, and the ones she thought she should hate were the ones who would give their lives for her safety. The romance was simmering and steamy, and always left me wanting just a bit more of it. That's the aspect of this book that really made it stand out more than the first one, because let's be honest I'm a sucker for romance. What I'll say is that this is a good series. It's not great, but overall I enjoyed the ride. I'm not sure whether the authors plan on continuing it as the ending seemed to be pretty wrapped up, but we'll see!